The Olate Dogs delight audiences on Sunday, Dec. 28, at the Sonoma Veterans Memorial Hall (126 First St., Sonoma; 2pm; $25–$35) and again on Monday, Dec. 29, at the Raven Theater (115 North St., Healdsburg; 7:30pm; $25–$35). Olatedogs.com. GOOD DOG Richard Olate went from the streets of Santiago to the world stage with more than a little help from his dogs. Richard Olate's story is the epitome of the American dream. A third-generation circus performer by birth, Richard was five years old when he had to start selling newspapers on the street corner and fish at the docks in his hometown of Santiago, Chile, to help support a family of 22 siblings raised by a single mother. 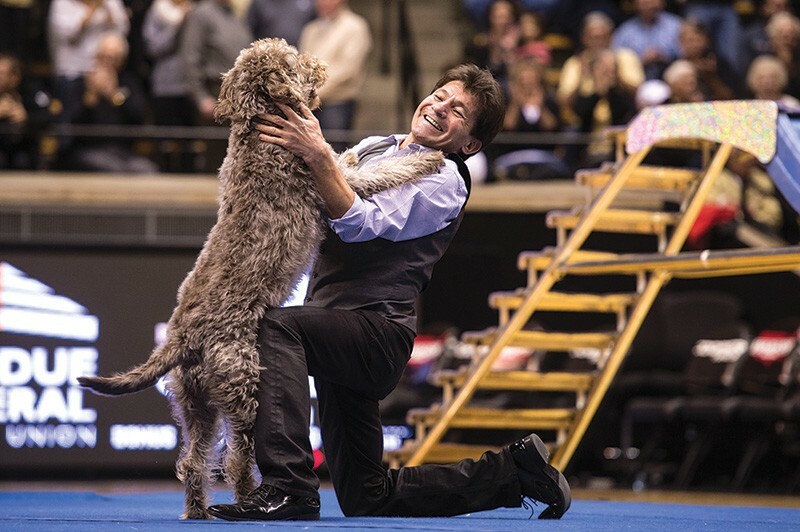 When he was 12, he found a poodle on the side of the road, one of many strays on the streets of the city, and Richard immediately found he had a natural talent to train and perform with his furry friend. Soon, that one poodle turned into a pack of pups that Richard trained to walk upright, jump rope and even do backflips. Richard and his dogs had lived and performed throughout South America for decades when a Circus Vargas scout discovered them in 1989 and brought them to America to travel with large-scale circuses coast to coast. Richard's youngest son, Nicholas, a natural performer himself, joined the act at age 15, and supports his father onstage and off. The Olate dog show comes to the North Bay this month. "We stayed dedicated and worked hard, and over the course of many years here, my father and I were able to get on America's Got Talent, and win it," says Olate. That's right, the Olate Dogs took the million-dollar first prize on the television show's 2012 season, catapulting them into the hearts of viewers and judges alike. "I was just so excited for [my father]," says Olate about winning the competition. "I was excited for him to accomplish that, with or without my help, because I knew where he came from and his background." Richard Olate's care for his dogs and his method of training are unique. He does not use food to train, nor does he resort to aggressive discipline or strenuous working schedules for his dogs. "He's just exceptionally patient with them, and finds a way to get the dog excited, by playing with them," says Olate. "Dogs are very intelligent, and they really do enjoy performing. There're no vigorous hours or anything. You just have to find what the dogs enjoy doing and work with that." Olate performs as his father's right-hand man, assisting in handling the dozens of dogs and the lengthy routines. More than just the quick tricks they perform on television, the Olate Dogs carry out fully realized and substantial comedy, dance and trick routines. The traveling troupe, which includes 22 dogs, including 10 rescue dogs, are performing a special Holiday Rescue Tour throughout California, raising awareness for rescue animals and donating thousands of dog meals to shelters through their sponsor, Halo. The show also brings the message of what rescue dogs can do for people. "There's nothing more selfless than to save an innocent animal's life and love them," says Olate.